as you receive support through Mary’s AMAZING Online Community. The Abundance Alive Healing and Coaching Support Community is chalk-full of support to assist and guide you on your healing journey. As you choose to join this community, you are opening yourself up to on-going support to assist you with your abundance, joy and well-being. You will have access to live calls with Mary each week – where she will answer your questions, and offer additional support, guidance, healing and coaching. If questions arise, in your life, you will have direct access to Mary and her team, ensuring your questions are answered and that you receive the support you need. In addition, you will have access to hundreds of archived calls from previous coaching programs, as well as the on-going live calls with Mary and her team – where they offer wisdom, coaching, guidance and additional healings. Many of our community members have experienced dramatic shifts and life-altering awarenesses after only listening to a few calls, yet by signing up, you have access to ALL the upcoming live and archived calls. Full and unlimited access to ALL coaching groups – You will have access to all of the calls and recordings of any coaching groups happening now, AND you will have full, unlimited access to ALL coaching groups that have happened through this community in the past as long as you are a current member. Bonus Audio Clips and Resources – In addition to the recordings from calls that have happened through this site, you also have access to ADDITIONAL audio clips and resources from Mary’s other products, programs and coaching sessions. These further enhances your learning. Discounted personal healing/coaching sessions – Mary’s Support Circle offers GREATLY DISCOUNTED sessions for one-on-one individual sessions. You can request a session at any time and can experience a variety of healing or coaching modalities just for you. This Abundance Alive Community is a place of safety, conversation, insights and healing for all who join. WOW is all that can be said! 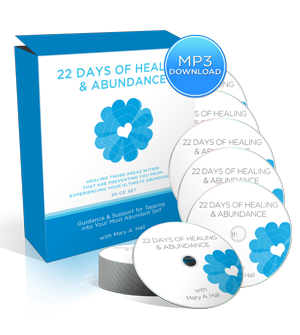 and gain full access to experience Mary and her life changing Healing and Coaching Programs! WOW and a WHOO HOO – THIS IS YOUR CHANCE!!! A REMARKABLE LIFE-CHANGING OFFER AT A HUGE 85% SAVINGS! to continue your access to the Abundance ALIVE Healing & Coaching Site! YOUR membership site access will begin upon purchase. "These past 8 weeks have been wonderful for me. When I started this course I had so many doubts and held beliefs that were setting me up for the wrong things in life. Today I feel like the world is open to me. Mary, you have provided the most powerful and wonderful tools in order to build the foundation for abundance. I feel so much better about all of the abundant possibilities before me. And now I ‘know" that every day is a divine blessed infinitely abundant day. This group has been wonderful to work with. Thank you Mary for blessing me with so many loving gifts." PRIVATE MEMBER ACCESS TO ABUNDANCE ALIVE!